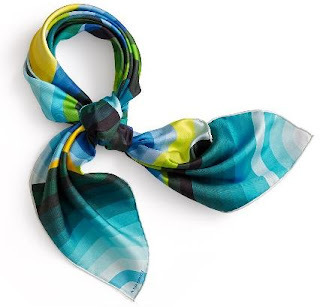 It hasn't been since Leigh Cooke's 2007 "In the Pocket" design that I felt so exuberant about a scarf - albeit for different reasons. Unlike the last time, when the pattern itself was the trigger of my admiration, today's "Cuirs du désert" ("leathers of the desert") mesmerized me with the colour combinations (for only some, evidently). 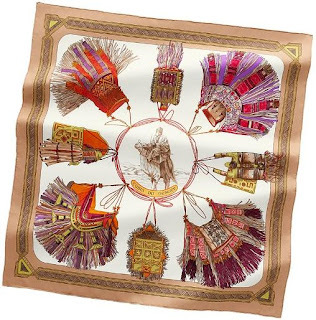 Upon closer inspection of the scarf design, I was equally taken by the detail of the leather pouches, bags and wallets that surround the Touareg - both as an hymn to the artisans and as a literal reflection of the objects that identify with their owners as they become the Touaregs' companions on the long journeys. The fringes, in particular, are depicted with a great deal of attention to the original details, and that, to me, is thoroughly impressive. Six colour variations resonated with me so much, I was at a loss for picking the two most impactful to display here, to complete the experience. To paraphrase a friend's reaction (in a different context), this scarf is both awesome and awful - as in the original definition ("full of awe" - the exact words originally chosen to describe Christopher Wren's St Paul's cathedral). 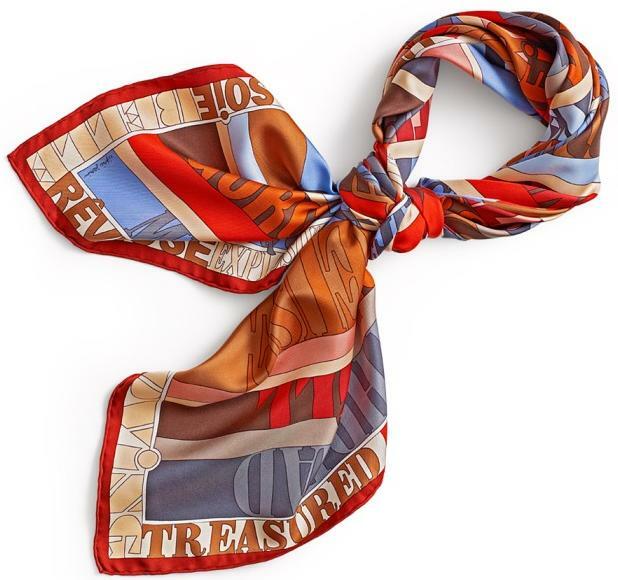 This scarf is a perfect successful example of reviving an original design from 1988 by reinterpreting it in colours that render the scarf contemporary. 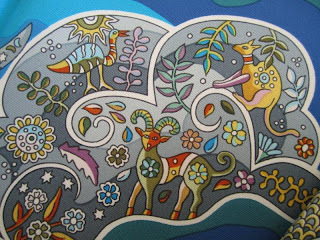 Its central depiction - the Touareg - triggered in me a nostalgia of the origins. Increasingly fewer people can recall the journeys that the first pioneers undertook, venturing into the unknown to find luxuries available in other parts of the world - and permitting those with a love of the unique a sublime experience and access to a world of dreams. 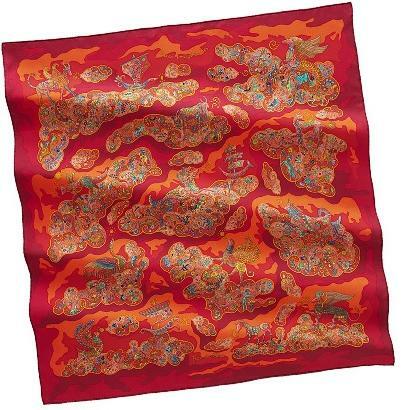 This quest has defined Hermès since the Maison's inception and is perhaps the chief element that resonates tremendously with me - and with all the admirers of the brand. So in this spirit I am dedicating this post to my friend (A) whose interest in all things beautiful and loyal patronage continues to fuel my desire to bring forth beautiful, phenomenal designs. 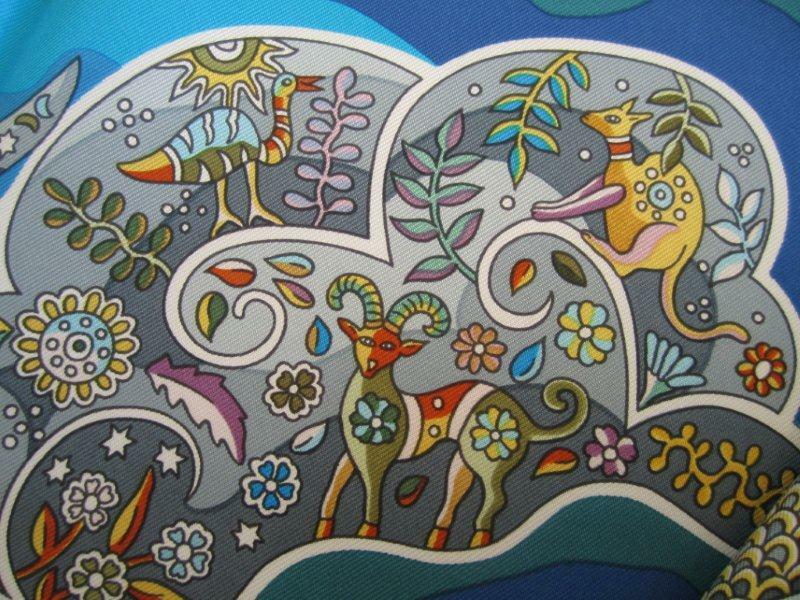 The tea pot amulet in the right hand corner of this design, with a monkey on its lid (that served as the inspiration for this pattern) gives wings to our imagination in this "rêve de corail" ("coral dream") design. Carmine, scarlet, magenta, cadmium red and, of course, coral red.... When was the last time you paused to think of a colour - and not just of any colour, but of red? The colour red's range of meaning has never ceased to amaze the imagination and intellect. Red's impact on cultures has garnered attention throughout history. And yet, its deepest essence continues to remain a mystery. Reds were the first colours to be used by the Neanderthal man when he began to paint and dye, long before he discovered how to extract the other colours from plants, roots and animals. In fact, red is not only the first colour known to man, it is the first man: the Judeo-Christians believe that God created man from red clay and gave him the name Adam, which in Hebrew (the language that God used to communicate with mortals) derives from the word "red". God was so passionate about his creation that he hid his colour from plain view. He let blue reign over the firmament and the endless seas, while green was allowed to proliferate over the brown earth. But red was reserved for an intimate place inside God's most beloved creations - particularly in the flesh and blood of his own image on earth. Red became the colour of beginnings and endings, of sunrises and sunsets, of birth and death. The biblical Near East and Mediterranean Europe - the Hebrews, the Greeks and the Romans - loved red and made it the colour of power and beauty. Since very ancient times, red has been perceived as beautiful, bright, lively and joyous - arousing admiration, pleasure and good fortune. In early Christian art, red was considered the colour of divine love, subsequently transported to the cardinals' vestments. The cardinals of the Roman Catholic Church have for centuries worn red as a symbol of their willingness to uphold the faith to the point of martyrdom. Yet Christianity also introduced a negative, disquieting and deadly interpretation of red - in contrast to its positive resonance. Then came the development of a chromatic symbolism based on the four cardinal points: two of the referents for red today remain fire and blood; only now, one must carefully distinguish between good fire and evil fire, between good blood and bad blood. The red of fire, in its benevolent manifestation, is that of the Pentecost and of the Holy Spirit. It is at once light and breath, powerful and redemptive. It is a red that shines, lights, heals and heats - just like the sun. Its malign aspect is the red of shadows, the flames of hell that burn without illumination. It is the satanic red that burns, wounds and destroys: the red of Judas' hair, the fur of vermin - like the treacherous fox - and above all, it is the red of the wily, lying, lustful and proud man. In Christian culture, blood red is largely that which gives life, transmits vital force, purifies and sanctifies. It is the red of the Saviour, the blood spilled on the cross to save mankind. It is a sign of vigour, energy, fertility and redemption. Conversely, red associated with bad blood is the symbol of impurity, violence and sin. Red is the stain of rage, of war and of death. To paraphrase Wassily Kandinsky, in no other colour would one see so much contrast than in red. Anyone who knows passion knows red. Red has always been first among the colours of the spectrum. Its primacy is not merely an arbitrary aesthetic choice; there is something imperious about red that makes it stand out. 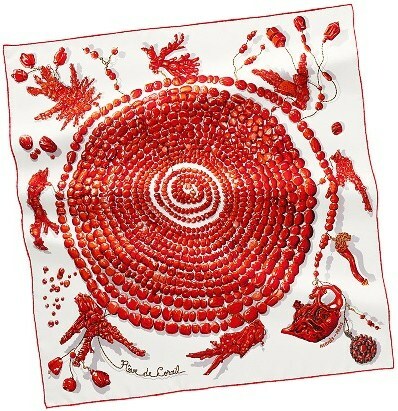 Indeed, red is a colour that demands to be seen ! And seen it is in this "rêve de corail" ("coral dream") design (as displayed above), where an apparent endless string, displaying coral pebbles in sequence, unwinds right before our eyes as an open invite for anyone to touch the "charms", the many artistically executed marvels of craftsmanship... or, conversely (mirroring the dual symbolism of red), the strand tempts our gaze to identify its loose end and from there, to follow the pebbles. And in this game of seduction, the coiling strand steals our gaze and hypnotically draws us closer and closer to the centre, leaving us wondering about just where that path will take us and ready to step beyond, to quench our curiosity, despite the change of getting lost. Even though this pattern reminded me of Valerie Dawlat-Dumolin's 2004 "impose ta chance" design, I loved it when I saw it displayed, because its assymetry resonated with me instantly. 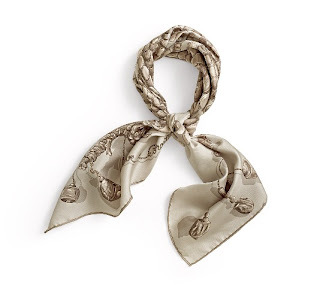 Yet, when knotted, I find the scarf becomes somewhat traditional - is it the tassle-looking images in the corners? I'm not sure why, but I find the scarf loses part of its charm and magic when tied. Still, I love this design for its power to make us dream, and I'd recommend it for anyone with a passion for marinelife or just for holiday destinations with a view of the ocean - but be sure that the colour matches your skin tone, for not all colour combinations are equally as impactful as the one above. Writing came about as a result of the prehistoric man's need to record the production and exchange of the goods he produced. Since then, the art of writing has recorded the entire range of human experience, from the sacred to the profane. Writing was destined to supply and preserve a record of the past, even at the expense of our ability to memorize. 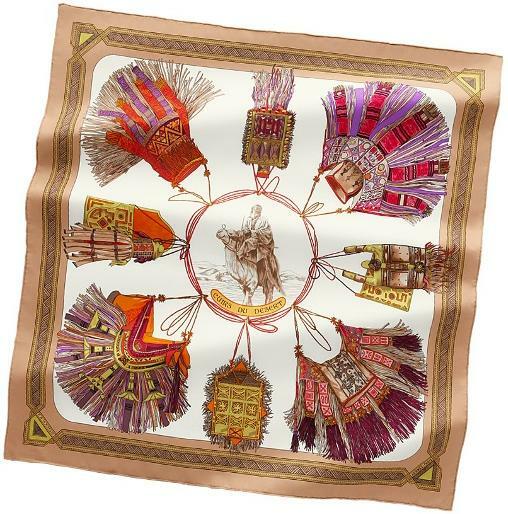 Hermes pays tribute, through this design, to the written words - words recorded on silk as a metaphor for all future generations to discover, embrace and protect the tasters of the past. The composition is very similar to "Le monde est vaste" - a design I spoke about last year, and a more recent design - "Les dix cavaliers" - of June 2010. 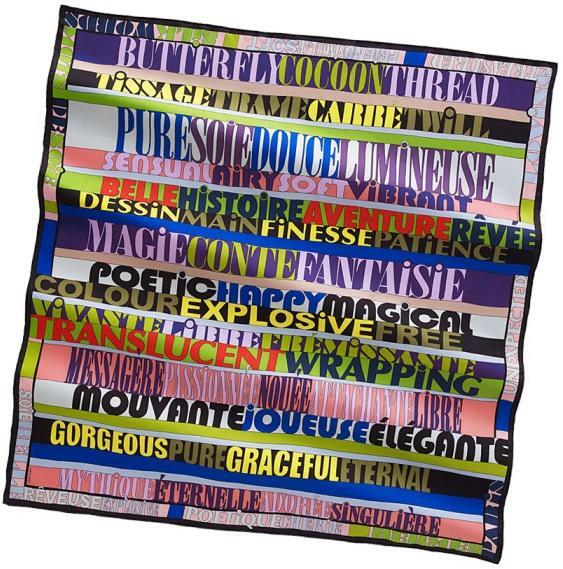 What I found surprising is the designer behind this scarf: no other than Virginie Jamin, the creator of "Belles du Mexique". 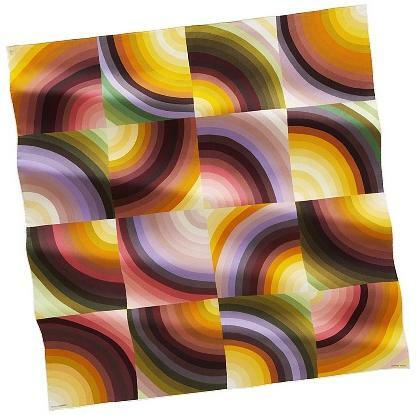 This pattern is such a departure from the previous style and approach. To me, what just such a departure indicates is the designer's versatility in expressing herself in a variety of styles, which may be encouraging or not, depending on the results. I would take the liberty to predict that this design will be nowhere near the previous one in terms of popularity. 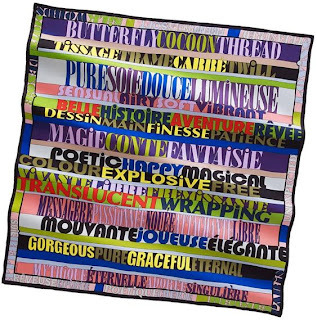 Still, the actual words recorded on this scarf are charming, full of positive resonance and simply enchanting. And since we touched on the concept of beauty in the context of the written word - as an integral component of a culture's most distinguishable expression: the language - a final thought on what would make a language beautiful. Early on, I used to think that certain languages (such as French, Italian and Greek) were truly beautiful; yet, with the passing of time, I came to realize that what makes a language beautiful is the speakers' choices of words (similar to a wedding, where beauty is dictated not as much by what the bride and groom wear, but rather by what all the guests wear, for when everyone is dressed elegantly, the entire wedding is elegant). So I cannot think of a more elegant invitation to all those who harbour a special appreciation for languages to search their memory for the words that had a special resonance with them throughout the years and enrich their communication styles with them. Due to its many colours in this combination and the additional characters (in complimentary hues), the pattern is quite busy, so the choice of this design will certainly reflect the wearer's personality (for instance, the scarf featured above has very strong colours, meant to reflect a strong personality whereas the one knotted below has very soft colours, mirroring a more discreet person). Upon close inspection of all of this season's designs, this is, without a doubt, my most favourite. Just as I have been in awe with most of Leigh Cooke's designs, I have come to appreciate, admire and adore some of this artist's beautiful creations. Christine Henry, the creative force behind today's design, has a unique gift of rendering images with the power of carrying us into far-away lands - taking us on a voyage to the gates of an Indian palace), offering us magical glimpses into the life along mystical rivers (in "Rives fertiles"), or uncovering for us the core of our world (in "Axis mundi"). Having taken us to discover earthly scenes, this season she is elevating us - with gentleness and grace - to a heavenly place ... quite literally. 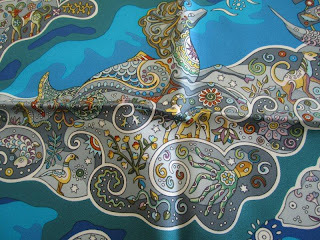 In "Nuées imaginaires" ("Imaginary clouds"), the designer reveals for us a magic world where fantastic creatures, born out of our rich imagination, live in perfect harmony - with each other and with the world. The creation - true to the artist's signature style - is a snapshot at a given time, a depiction that is fixed in time and space yet where the viewer can detect, indeed "feel", the energy of every scene. Each scene is a reflection of an individual dream whose details we can recognize even long after we opened our eyes - like a sun ray coming from a high-above window that reveals the detail of a story encaptured in the mosaique down below. Together, the scenes make an ensemble that reveals before our eyes like a beautiful lyrical composition, an opera in which the story is captured and enriched with every area that enchants the listener and that continues to linger in the audience's mind long after the courtain has fallen.The colours of most of the scarves in this design are very vibrant and well-defined, as we experienced in her more recent creations - an element of design that makes for a very youthful scarf. Overall, this design renders the scarf very sophisticated, if somewhat mature in this regard - and only a person with a strong character and personality will find it appealing. 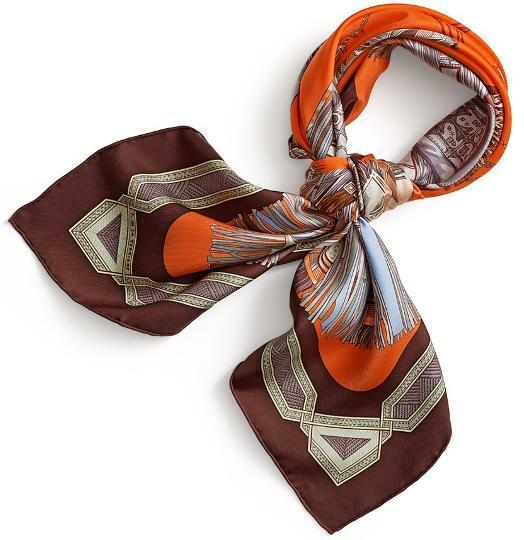 In blue, this scarf is phenomenal for the discreet orange accents (both the border as well as select details of the design). 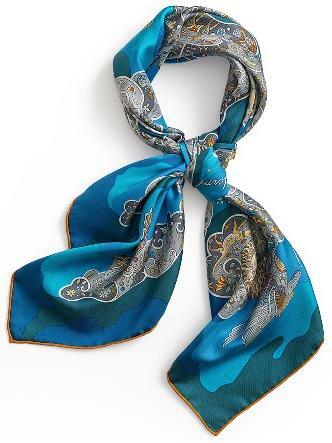 The other aspect of this scarf that I find particularly appealing is the combination of blue and grey as its predominant colours. Very very chic ! What a joy to begin the new year with a brand new post, one that reveals a tremendous departure from what we came to expect from the Maison. A timeless saying teaches us that you cannot expect a new outcome simply by following the same steps in completing the tasks. 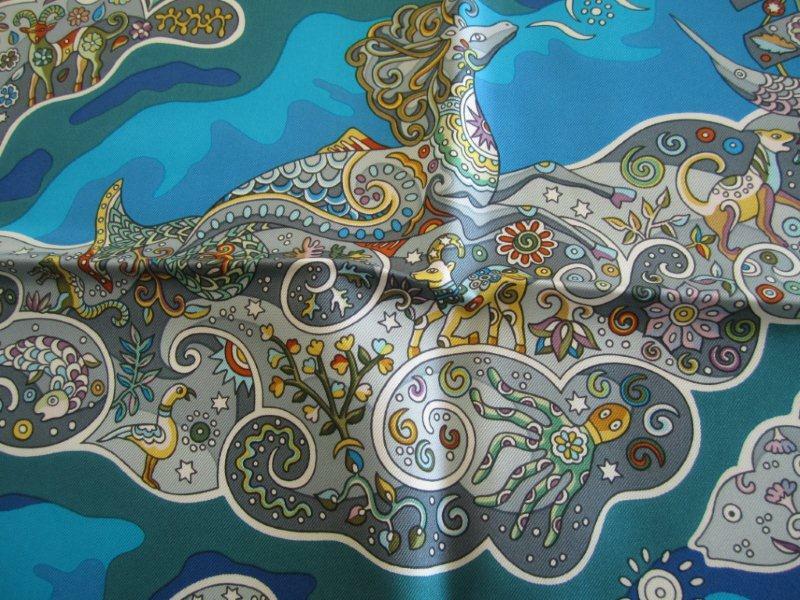 In other words, to achieve different results we must attempt new approaches - and it is in this spirit that I will present the "Marcelina" design, a completely different pattern than any other I have seen in the long series of designs produced by Hermes since 1932 (the documented launched of the scarves, although the first scarves produced for the public were launched only in 1937). This pattern looks much more appealing when the scarf is knotted, as it has a retro air to it yet the choice of colours gives it a very youthful flair. May this be an encouragement for all of us to attempt a new approach to life's problems, an approach that may even prove more successful than before - and while the result is not guaranteed to succeed, if we don't take the risk, we surely know what to expect.